Endotracheal tubes used for neonates are not as resistant to breathing as originally anticipated; therefore, spontaneous breathing trials (SBTs) with continuous positive airway pressure (CPAP), without pressure support (PS), are recommended. However, PS extubation criteria have predetermined pressure values for each endotracheal tube diameter (PS 10 cmH2O with 3.0- and 3.5-mm tubes or PS 8 cmH2O with 4.0-mm tubes). This study aimed to assess the validity of these SBT criteria for neonates, using an artificial lung simulator, ASL 5000™ lung simulator, and a SERVO-i Universal™ ventilator (minute volume, 240–360 mL/kg/min; tidal volume, 30 mL; respiratory rate, 24–36/min; lung compliance, 0.5 mL/cmH2O/kg; resistance, 40 cmH2O/L/s) in an intensive care unit. We simulated a spontaneous breathing test in a 3-kg neonate after cardiac surgery with 3.0–3.5-mm endotracheal tubes. We measured the work of breathing (WOB), trigger work, and parameters of pressure support ventilation (PSV), T-piece breathing, or ASL 5000™ alone. WOB displayed respiratory rate dependency under intubation. 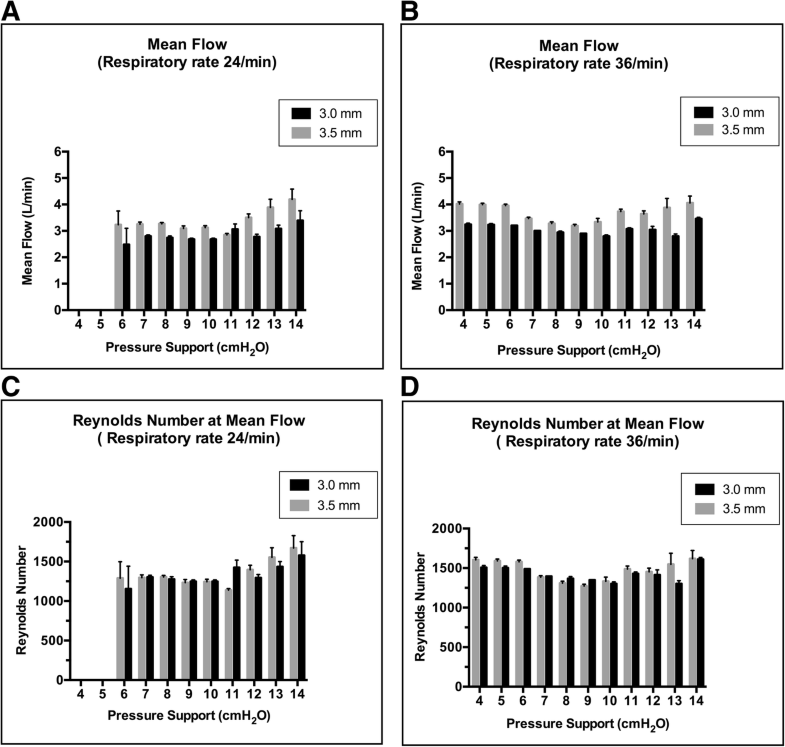 PS compensating tube resistance fluctuated with respiratory rate. At a respiratory rate of 24/min, the endotracheal tube did not greatly influence WOB under PSV and the regression line of WOB converged with the WOB of ASL 5000™ alone under PS 1 cmH2O; however, at 36/min, endotracheal tube was resistant to breathing under PSV because trigger work increased exponentially with PS ≤ 9 cmH2O. The regression line of WOB under PSV converged with the WOB of T-piece breathing under PS 1 cmH2O. Furthermore, PS compensating endotracheal tube resistance was 6 cmH2O. The WOB of ASL 5000™ alone approached that of respiratory distress syndrome (RDS); however, the pressure of patient effort was normal physiological range at PS 10 cmH2O. PS equalizing WOB under PSV with that after extubation depended on the respiratory rate and upper airway resistance. If WOB after extubation equaled that of T-piece breathing, the PS was 0 cmH2O regardless of the respiratory rates. If WOB after extubation approximated to that of ASL 5000™ alone, the PS depended on the respiratory rate. SBT strategies should be selected per neonatal respiratory rates and upper airway resistance. Mechanical ventilation weaning has become a common procedure in the neonatal intensive care unit. Extubation failure reportedly increases morbidity, length of hospital stay, and mortality . 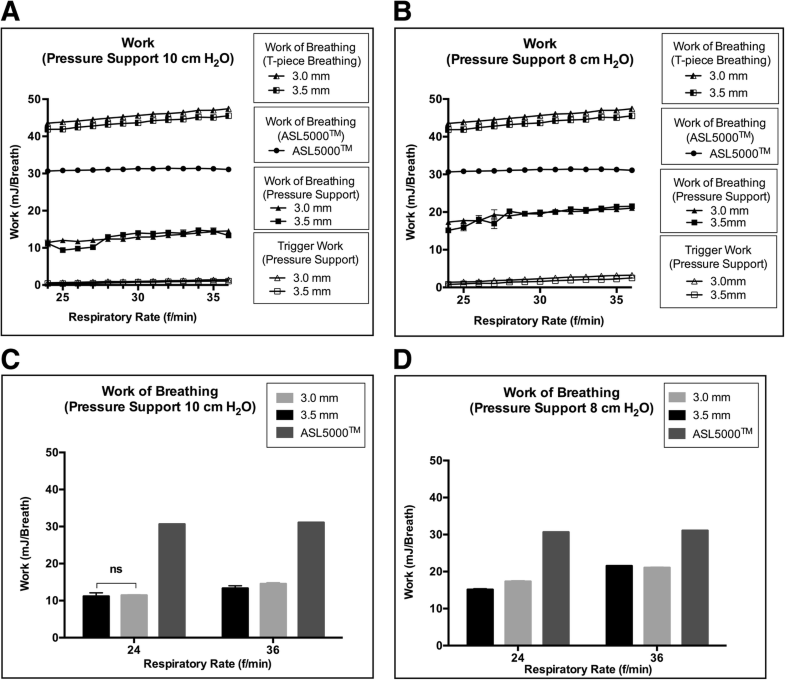 Spontaneous breathing trials (SBTs) with pressure support (PS) are better than continuous positive airway pressure (CPAP) for adults because successful SBT rates with PS are higher than CPAP without an increase in the reintubation rate [2, 3]. There are both pros and cons to apply pressure support for spontaneous breathing trials in infant. Endotracheal tubes used in neonates are not as resistant to breathing as was originally anticipated [4–6]; therefore, spontaneous breathing trials (SBTs) with CPAP, without PS, have been recommended [7, 8]. However, SBT with PS is reportedly useful and the positive predictive value of successful extubation is 93% . The PS criteria for SBTs are set at 10 cmH2O with 3.0- and 3.5-mm tubes or at 8 cmH2O with 4.0- and 4.5-mm tubes [9–12]. There are obvious discrepancies between the two theories [7, 9]. It is difficult to clinically evaluate work of breathing. This study aimed to assess the validity of these criteria for neonates. We conducted a lung simulation study using a high-end lung simulator to investigate the effect of reductions in PS and increase in the respiratory rate on SBTs. We used an IngMar ASL 5000™ artificial lung simulator (version 3.4, 3.5; IngMar Medical, Pittsburgh, PA) with a built-in cylinder with a 17.8-cm diameter. The ASL 5000™ is a popular lung stimulator, which can imitate different breathing conditions and can measure various ventilation parameters including WOB, trigger work (TW), pressure of effort (pressure of muscle [Pmus]), maximum pressure drop during trigger, and positive end-expiratory pressure (PEEP). Respiratory parameters are automatically displayed on the control panel. We regarded the ASL 5000™ as a model of the lower respiratory tract (i.e., the upper respiratory tract was not included). We set the ASL 5000™ to reflect a 3-kg neonate after cardiac surgery to simulate SBTs with compliance at 0.5 mL/cmH2O/kg  and resistance at 40 cmH2O/L/s. The reference values for healthy neonate compliance and resistance are 1.5–2.0 mL/cmH2O/kg and 20–40 cmH2O/L/s, respectively [13, 14]. The ASL 5000™ was set to the constant VT mode under computer control, with a tidal volume of 30 mL (10 mL/kg) and a minute volume of 720–1080 mL/min, which corresponds to a respiratory rate (f) of 24–36/min. Endotracheal tubes with an inside diameter of 3.0 and 3.5 (Mallinckrodt™; Hi-Contour Oral/Nasal Tracheal Tube Cuffed Murphy Eye, Dublin, Ireland) were clinically curved and cuffed to prevent gas leakage. A 22/19-mm adapter with a built-in duct (diameter, 9 mm) was attached because the port of the ASL 5000™ was too large to attach an endotracheal tube. A ventilator (SERVO-i Universal™, version 3.0.1; Maquet, Danvers, MA) was set at PSV: PEEP, 4 cmH2O; FIO2, 0.4; inspiration time was set at 45% of respiration; and bias flow of 0.5 L/min was continuously delivered to the respiratory circuit. Trigger sensitivity was set to 5 to detect bias flow deviation of 0.25 L/min at the expiratory channel. The ventilator was connected to the artificial lung by means of a respiratory circuit (Smooth-Bor™; Smooth-Bor Plastics, Laguna Hills, CA). No respiratory humidifier or heat/moisture exchanger was used. The following work and pressure parameters were measured under three breathing settings: (1) ASL 5000™ alone, (2) T-piece breathing, and (3) PSV. The parameters were measured under two control settings: the respiratory rate control setting and the PS control setting. At first, the parameters of all three breathing settings were measured in the respiratory rate control setting. In the respiratory rate control setting, the respiratory rate was increased from 24 to 36/min. The parameters under PSV were measured with a fixed PS of 10 cmH2O and 8 cmH2O in the respiratory rate control setting. Then, the PS control setting was used under PSV alone. The parameters were measured under the PS control setting with a fixed respiratory rate of 24 and 36/min. Under the PS control setting, PS was decreased from 14 to 0 cmH2O. WOB measurement was started at 0.5 mL of gas inhaled and ended at 0.5 mL gas exhaled. TW was defined as the WOB between the start of the WOB measurement and the point in time at which airway pressure returned to baseline (PEEP), after a downward deflection. WOB and TW were calculated using Eq. (1) (below). Patient effort was defined as the negative of muscle pressure [− Pmus], which resembles an esophageal pressure tracing. We specified that the WOB of the ASL 5000™ alone must be lower than the WOB after extubation, because the ASL 5000™ did not include the upper respiratory tract. WOB was measured at a stable tidal volume, and the mean and standard deviation values were determined from 10 breaths to account for instability. Peak inspiratory pressure (PIP) is the pressure which is delivered by ventilator. Dynamic distending pressure of T-piece breathing is equivalent of Pmus of T-piece breathing, because T-piece breathing is not under pressure support. The Reynolds number was calculated from the mean and peak flow using Eq. (3) . where we used the following constants: 20 °C; dry gas, FiO2, 0.4, viscosity η (poise = 0.1 Pa s = kg/m s), 18.72 × 10−6, and density ρ (g/cm3), 1.231 × 103 [16, 17]. V̇ is the mean flow rate (cm3/s), r is the inner radius of the tube (cm), and π is the ratio of the circumference of the circle to its diameter. Ten successive breaths per condition were measured. We used two-way analysis of variance (ANOVA) with Tukey’s multiple-comparison test for statistical analyses. WOB and TW were analyzed by linear or non-linear regression analysis as appropriately. All statistical analyses were performed using GraphPad Prism (GraphPad Software, Inc., La Jolla, CA). A p value < 0.05 was considered statistically significant. Under the respiratory rate control setting, WOB during T-piece breathing was higher than WOB of the ASL 5000™ alone and WOB of the ASL 5000™ alone was significantly higher than WOB under PS 10 cmH2O and PS 8 cmH2O in terms of physiological minute volume regardless of tube size (Fig. 1a, b). 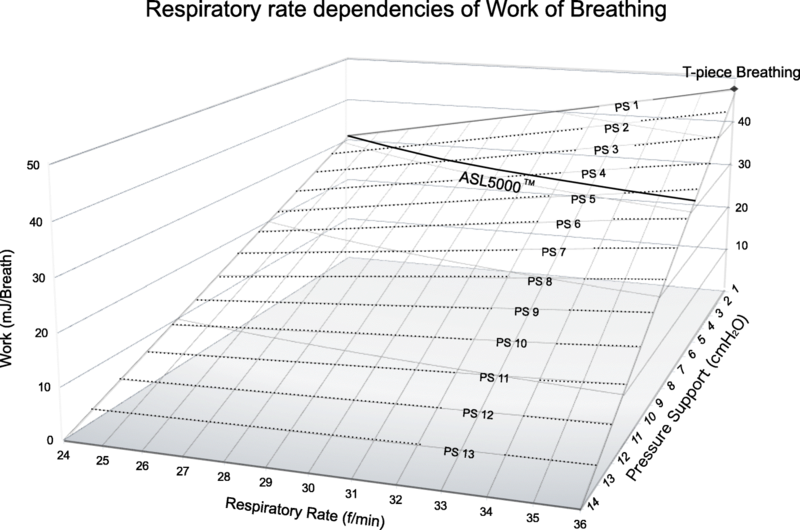 Although WOB during T-piece breathing and WOB under PS increased as the respiratory rate increased, WOB of ASL 5000™ alone did not increase as the respiratory rate increased. WOB with different tube sizes were approximately the same (Fig. 1C, D). When PS was set to 8 cmH2O, Pmus with 3.0–3.5-mm tubes deviated from the normal physiological range (− 3 to − 8 cmH2O)  (Fig. 2a, b), even when WOB under the PS was lower than WOB of the ASL 5000™ alone (Fig. 1a, b). Additionally, the maximum pressure drop during trigger with a 3.0-mm tube deviated from the normal range (− 0.5 to − 1.5 cmH2O)  (Fig. 2c, d). Development of auto-PEEP was dependent on the respiratory rate and tube size (Fig. 2e, f). Auto-PEEP occurred with 3.0-mm tubes at a respiratory rate of 24/min and with 3.5-mm tubes at a respiratory rate of 28/min (Fig. 2e, f). WOB increased sigmoidally as the respiratory rate increased, due to the development of auto-PEEP (Fig. 1a, b). Under the PS control setting, WOB increased linearly as PS decreased from 14 cmH2O. Investigations were stopped at PS 5 cmH2O with a respiratory rate of 24/min and at PS 3 cmH2O with a respiratory rate of 36/min, because double-triggering and mis-triggering frequently occurred (Fig. 3). WOB increased more rapidly as PS decreased at a respiratory rate of 36/min than at a respiratory rate of 24/min (Fig. 3a–d). TW at a respiratory rate of 24/min increased linearly as the PS decreased (Fig. 3a, b). TW at a respiratory rate of 36/min increased exponentially as PS decreased from 9 to 4 cmH2O (Fig. 3c, d). At a respiratory rate of 36/min, WOB with 3.0–3.5-mm tubes under PS ≤ 5 cmH2O was higher than that of the ASL 5000™ alone (Fig. 3c–d). The regression line of WOB under PS was drawn from PS 14 to 1 cmH2O. The regression equation under PS was not obtained at PS 0 cmH2O because WOB of PS 0 cmH2O was not under PS ventilation, and there was a difference in the assumption (Fig. 3a–d). The regression line of WOB under PSV at a respiratory rate of 24/min converged to WOB of ASL 5000™ alone as PS decreased (Fig. 3a, b). The regression line of WOB under PSV intersected with WOB of ASL 5000™ alone at PS 2.5 cmH2O with the 3.0-mm tube and PS 1.2 cmH2O with the 3.5-mm tube. The regression line of WOB and TW at a respiratory rate of 36/min converged to WOB of T-piece breathing as PS decreased (Fig. 3c, d). The regression line of WOB under PSV at a respiratory rate of 36/min intersected with WOB of T-piece breathing at PS 1.1 cmH2O with the 3.0–3.5-mm tube. Dynamic distending pressure at a respiratory rate of 24/min showed a result similar to that obtained with T-piece breathing regardless of PS (Fig. 4a). Dynamic distending pressure at a respiratory rate of 36/min using PS ≤ 9 cmH2O with 3.5-mm tubes and PS ≤ 8 cmH2O with 3.0-mm tubes was higher than that with T-piece breathing (Fig. 4b). Maximum mean flow was 4.1 ± 0.2 L/min with 3.5-mm tubes and 3.5 ± 0 L/min with 3.0-mm tubes under PS 14 cmH2O at a respiratory rate of 36/min (Fig. 5a, b). The Reynolds number at mean flow was < 1760: 1619 ± 98 with 3.5-mm tubes; and 1610 ± 22 with 3.0-mm tubes at PS 14 cmH2O (Fig. 5c, d). Reynolds number values at peak flow were > 2000: 3737 ± 25 with 3.5-mm tubes and 3308 ± 32 with 3.0-mm tubes at PS 14 cmH2O. During T-piece breathing, mean flow was 3.3 ± 0 L/min with 3.5-mm tubes, and 3.1 ± 0 L/min with 3.0-mm tubes, at a respiratory rate of 36/min. The Reynolds number at mean flow was < 1760: 1316 ± 0 with 3.5-mm tubes and 1447.3 ± 14 with 3.0-mm tubes during T-piece breathing. All Reynolds number values at peak flow were > 2000: 2672.6 ± 0 with 3.5-mm tubes and 2750 ± 2.9 with 3.0-mm tubes during T-piece breathing. Mean flow was 3.6 ± 0.1 L/min with the ASL 5000™ alone. With the ASL 5000™ alone, the Reynolds number values were 227.8 ± 4.4 at mean flow and 505.8 ± 2.9 at peak flow, at a respiratory rate of 36/min. This study reports a respiratory rate dependency of WOB under intubation. At a respiratory rate of 24/min, the endotracheal tubes may not greatly affect WOB under PSV because the regression line of WOB under PSV converged with that of ASL 5000™ under PS 1 cmH2O. At a respiratory rate of 36/min, endotracheal tubes were resistant to breathing because TW increased exponentially under PS ≤ 9 cmH2O. The regression line of WOB under PSV converged with that of T-piece breathing under PS 1 cmH2O. According to the two regression lines, if the regression line of WOB under PS 1 cmH2O connects WOB of ASL 5000™ alone at a respiratory rate of 24/min with WOB of T-piece breathing at a respiratory rate of 36/min, the three-dimensional surface of the WOB under PSV with 3.5-mm tubes is approximated by Eq. (4) (Fig. 6). fB is the respiratory rate per min. Assuming that the WOB of ASL 5000™ alone is fixed at 30.7 mJ/Breath, which is the WOB of ASL 5000™ alone at a respiratory rate of 24/min, the PS compensating 3.5-mm tube resistance is approximated by the following equation as a function of respiratory rate (5). Therefore, the PS compensating tube resistance fluctuates with the respiratory rate. Upper airway resistance is similarly dynamic, depending on nasal breathing, mouth breathing, or respiratory support . Nasal airway resistance accounts for approximately two thirds of total upper airway resistance, and the resistance is comparable to that of the 3.0–3.5-mm tube . However, the glottis and larynx contribute to less than 10% of total upper airway resistance . PS equalizing WOB under PSV with that after extubation depended on the respiratory rate and upper airway resistance. If WOB after extubation equaled that of T-piece breathing, the PS was 0 cmH2O regardless of the respiratory rates. If WOB after extubation approximated to that of ASL 5000™ alone, the PS depended on the respiratory rate. 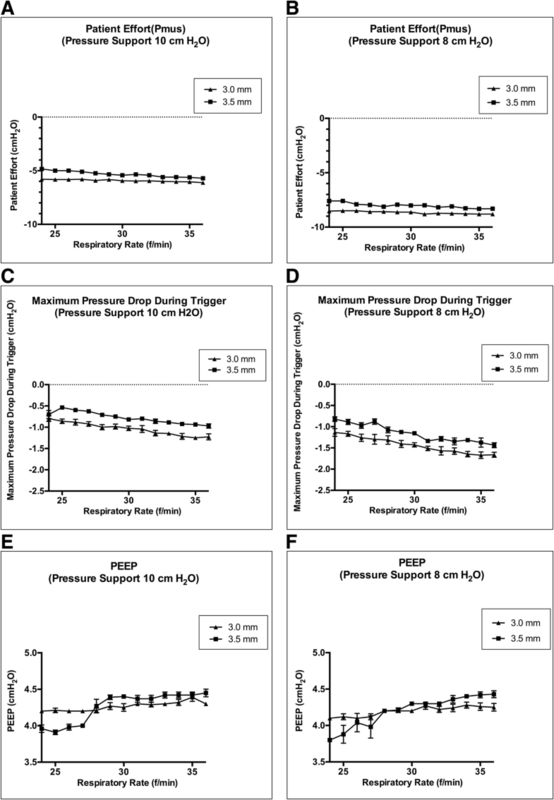 Minimum PS is adequate for neonates in a better condition, requiring a lower respiratory rate; however, PS compensating tube resistance may be necessary for neonates in marginal respiratory conditions, requiring higher respiratory rates. SBTs with PS 10 cmH2O are so potent that patient effort is decreased to normal physiological range under respiratory distress syndrome (RDS)-like conditions regardless of tube size [5, 22, 23]. Extubation is not recommended for neonates intolerant to SBTs even at PS 10 cmH2O. At a respiratory rate of 36/min with 3.0–3.5-mm tubes, the pressure of patient effort exceeded the physiological range under PS 8 cmH2O even when WOB under PSV was lower than that after extubation. Furthermore, it is necessary to evaluate patient effort to assess SBTs. Tachypnea and flow starvation may impose non-physiological stress on the lungs . Furthermore, the Reynolds number at mean flow was < 1760 and was > 2000 at peak flow under intubation. Therefore, gas flow became turbulent at peak flow and then decelerated markedly to a laminar flow, regardless of tube size, because the lower critical Reynolds number is approximately 1760, below which turbulent structures cannot be sustained by any induced disturbance . The pressure gradient of turbulent flow produces fluid flow less efficiently than that of laminar flow [26–28], which may have affected WOB and pressure parameters. The upper critical value of the Reynolds number for transition from a laminar to a turbulent flow cannot be generalized even when at 2000 in clinical practice. Hof et al. reported that “Most pipe flows are turbulent in practice even at modest flow rates”. The inlet diameter of ASL 5000™ was sufficiently large, such that inspiratory flow constantly remained laminar with an increase in respiratory rate because the Reynolds number was constantly < 1760. These results potentially explain why WOB of ASL 5000™ alone did not increase with an increase in respiratory rate in addition to the difference in inlet diameter and absence of tube length resistance. The ASL 5000™ is an artificial lung model that excludes the upper respiratory tract. In our study, we could not determine the pressure at which WOB would be equivalent to WOB after extubation. The tidal volume of the ASL 5000™ can be set in increments of 10 mL. We considered the physiological tidal volume to be 5–8 mL/kg. A tidal volume of 20 mL cannot cover 8 mL/kg (24 mL for a 3-kg infant); therefore, we chose to use a tidal volume of 30 mL. The upper limit of respiratory rate was determined by dividing the physiological minute volume of 1080 mL/min by the tidal volume of 30 mL. We added PEEP at the minimum required value of 4 cmH2O for neonates, which was lower than that generally used during SBTs. However, there was no atelectasis or tidal recruitment in the ASL 5000™; therefore, the PEEP value of 4 cmH2O seemed to have minimal impact on this study. Gas is heated and humidified in a clinical setting, but humidified gas could not be used for the ASL 5000™. Water vapor has a lower density and viscosity than oxygen or nitrogen; kinetic viscosity (η/ρ [m2/s]) increased from 15.1 × 10−6 to 16.6 × 10−6 with heating and humidification of dry air at 20 °C to relative humidity of 100% at 37 °C, and the Reynolds number decreased by approximately 9%. Therefore, heating and humidification may not greatly affect fluid characteristics [17, 26, 29]. WOB displayed respiratory rate dependency under intubation. We should judge which strategy is appropriate for neonates in various respiratory conditions. A part of this study was presented at the 44th annual meeting of the Japanese Society of Intensive Care Medicine, Sapporo, Japan, on March 10, 2017. This study was supported by a research grant from Yokohama City University, Yokohama, Japan. The authors have disclosed that they do not have any conflicts of interest. The datasets generated and analysed during the current study are available from the corresponding author upon reasonable request. YY and YM participated in the design of the study and helped to draft the manuscript. TM conceived the simulation study and helped to draft the manuscript. MO and OY participated in the design of the study and helped to draft the manuscript. TG helped to draft the manuscript. All authors read and approved the final manuscript.